In the past, most tax lien auctions were time-consuming and intensive processes. Bidders had to either take off from work or have some type of representation at each auction. GovEase has created a unique setup that alleviates this laborious process by allowing bidders to bid for tax liens online. 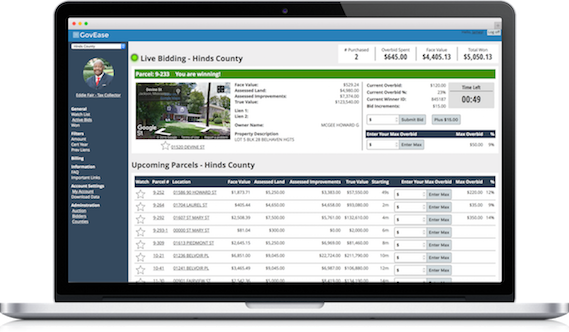 Bidders can watch each auction or upload a list that auto bids with preset amounts on liens of interest. We are bringing the auctions to the bidders. The GovEase team has over 20 years’ experience building and deploying innovative applications for local, county, and state governments across the United States. We design all of our systems to be user friendly. Our design process starts with feedback from the end user which allows us to provide an easy-to-use interface. By using this approach, we have created a seamless experience in the GovEase auction program. Everything from Google Street View integration to our own proprietary bidding algorithms provides unmatched functionality combined with an easy-to-understand interface.